Roof Coatings Are Often Considered A Green Roof Installation, For A Few Simple Reasons. Are you looking for ways to save energy, as well as reduce your company’s impact on the local environment? If so, a green roof installation in Texas, Louisiana, and Mississippi, may be the ideal solutions for you. With over 20 years of experience, our team can help you with a wide variety of roofing services, including green roofing and cool roofing. To learn more, read on, or speak with one of our roofing experts at (833) 200-0571 today! Green roofing is a term that is thrown around a lot, and often it can seem to apply to different things. In some cases, green roofing can refer to a roof that reduces your building’s carbon footprint, such as a roof coating. By enabling the roofers to apply a roof coating over the existing roof, the existing roof won’t end up in a dump, contributing to landfill waste. 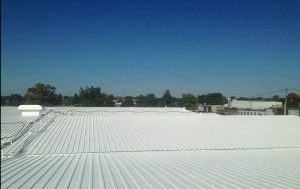 Additionally, roof coatings can improve a building’s UV resistance, which in turn leads to less energy waste. In those ways, roof coatings are considered a green roofing option. In this context, green roofs are any roof that reduces a building’s environmental impact. In other scenarios, the term green roofing applies to roofs that are quite literally green with vegetation. Commonly used across Europe, such roof systems are designed to not only cool the building they are on, but also the air around them. Roofs with organic plant life have been shown to reduce temperatures within heavily populated cities quite effectively. Additionally, these types of green roofs play a role in creating additional growing space for native plant species. By incorporating this type of green roof installation, centralized cities are able to reduce urban heat effects, as well as cut down on greenhouse gases produced by additional energy requirements. In some areas, green roofs have been used to cultivate vegetables for building inhabitants, as well as to support endangered local bird species. If you are interested in learning more about green roof installation in Texas, Louisiana, and Mississippi, give us a call today at (833) 200-0571! We have more than 20 years of experience in the roofing industry, and even though we specialize in roof restorations, we are happy to help our clients with any and all of their roofing needs. We are also proud to work with Conklin Roofing products, an innovative company in terms of green initiatives, and a long-term purveyor of top quality roofing products!